Great views from the Montagne de Gresse on Saturday. Happy New Year! 2018 has been a bumpy ride out here in South East France with lots of extreme weather, heavy snow fall and Storm Eleanor, who brought avalanches, rock fall, landslides and flooding to the region, including all of the above to our valley. Being from Arran, we are used to wild conditions, but recent days have surprised everyone, including the locals. The avalanche hazard in the high mountains is still at Level 3 in the valley, and it is even higher further east. Sometimes a cafe or admin day is the best option. Nevertheless, we've enjoyed some excellent adventures in between the storms, and when Eleanor was at her peak, we headed south and west to Provence for a couple of days respite, cycling in the sun. I was also grateful to grab a solo day sunshine on Saturday, snowshoeing near Gresse en Vercors. This week my friend and colleague Cat from Reach the Peak has joined me as a partner in snowshoeing crime. 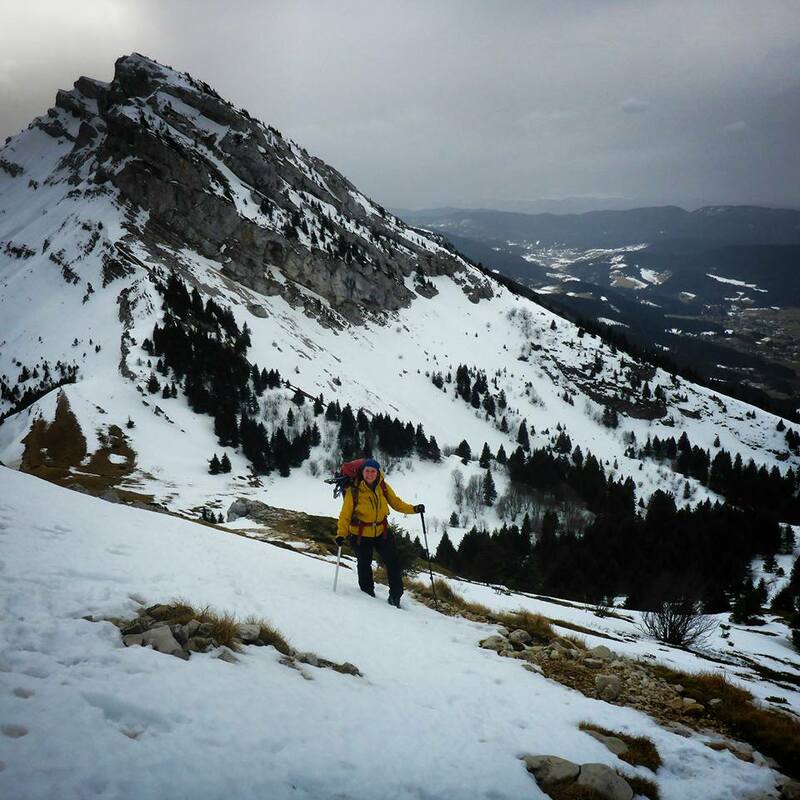 Today we were in the Vercors massif, enjoying firm snow, and watching rain fall on all the peaks around us apart from our own- St Michel, which seemed to resist the rain until we were well on our way back to Bourg. The Vercors has been a brilliant place to retreat to while the higher areas have such difficult conditions, but the snow pack is melting there, and becoming increasingly patchy. If only we could coax some of the snow falling in the east a bit further down hill? Ascending Pic Sant Michel via the Col de l'Arc. Lucy writes: Its been a busy three days for us! It began on Friday, with me working in the East on the first day of a winter skills workshop for Nineonesix Guiding in partnership with the SYHA. This great wee course was supposed to have been delivered in torridon, where the stunning scenery and remote location ensure an special and unique experience. Sadly our reluctant winter has put paid to that, and the course was relocated to the Cairngorms, where more reliable coonditions ensured a quality outdoor classroom was available. We had a great day, covering some navigation (despite the good vis) and avalanche avoidance, as well as movement skills with and without crampons. Meanwhile....Wally was having some fun with a personal solo day out on the East Ridge of Beinn A Chaorainn, a grade I winter climb and a fine easy mountaineering route. Saturday saw Wally doing a CPD Avalanche Avoidance refresher on Aonach Mor with the Scottish Avalanche Information Service, and generously supported by the Chris Walker Memorial Trust. Like first aid training, keeping these skills up to date and fresh is an important part of staying current as a winter leader, and so we grab every opportunity we can to learn from experts in this field. Worth remembering though that whilst its easy to get geeky about snow, the basics are simple- knowledge of weather, snowpack, terrain and human factors form the basis of good planning and decision making, supported by forecasts from the SAIS avalanche if available. Meanwhile, on the mountain next door, I was working for West Coast Mountain Guides, helping to guide a team of seven intrepid lads to the summit of Ben Nevis as part of a winter Three Peaks Challenge. Finally, yesterday Wally and I were working together, this time for Reach The Peak, on an introductory winter skills day on Ben Vorlich, near Loch Earn. Our team of ten intrepid hillwalkers certainly experienced the "Full Scottish", with spindrift, high winds, and deep snow. We managed to get lots of learning in depsite the weather!